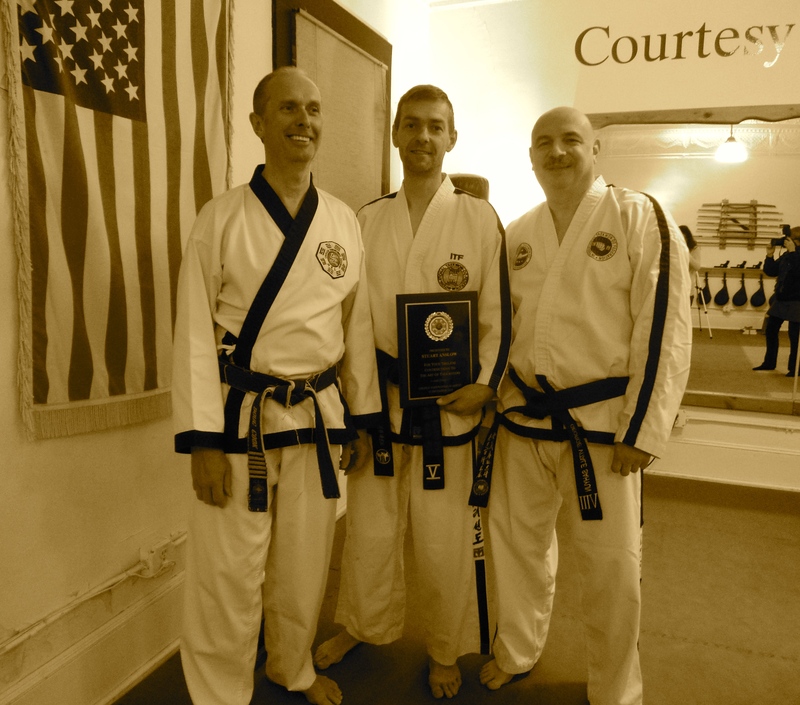 Master Doug Cook, Author Stuart Anslow, and Dr George Vitale at Master Cook’s Chosun Taekwondo Academy, a fine example of traditional Taekwondo. I am often perplexed with trying to figure out what is meant by traditional Tae Kwon Do. At times it gets a bit frustrating, as it is usually tough enough to come to a consensus on what exactly Tae Kwon Do is! So it seems there as just as many ways to consider what is traditional Tae Kwon Do to what Tae Kwon Do itself is! However I can honestly state that when looking at the textbook guidance of the dictionary and then applying traditional to Tae Kwon Do can easily been seen as a contradiction in terms. Clearly Tae Kwon Do is a modern Korean Martial Art, soon to be celebrating its only 60th year in existence. In America when you have your 60th birthday, you are still too young to collect social security and are not yet commonly defined as a senior citizen by most measures. Since the examination of the nomenclature didn’t help me much and may have possibly confused me even more, lets then look at the activity itself. Many in Tae Kwon Do use traditional as a euphemism to avoid the connection to the over emphasis on sports competition that has permeated Taekwondo. The successful entrance of Taekwondo into the Official Olympic Program has enhanced Taekwondo’s profile and resulted in the influx of revenue to support elite “players” which no doubt has contributed to it becoming the world’s most popular Martial Art. Thus the increasing volume of the critics within Tae Kwon Do claim they are not sport oriented, but traditional. Those Martial Artists outside of Tae Kwon Do tend to lump all Tae Kwon Do into the same category, claiming Taekwondo is a martial sport and not a traditional Martial Art. Is there then a traditional Tae Kwon Do? If so, where can we find it? How can we describe what it is so we can seek it out? Well possibly the easiest way to solve this dilemma is to borrow a quote from the late Justice P. Stewart, a former Justice on the U.S. Supreme Court, when he stated “I know it when I see it” in a 1964 case. The Justice “memorably summarized” a concept that had caused much confusion that it eventually made its way to the Highest Court in America, where even his fellow Justices could not define the issue. This is perhaps the most often quoted line in the Supreme Court’s history. The phrase is often used when subjective categories lack clear parameters or like the case of Tae Kwon Do, have contradictory parameters. So yes I think I know it when I see it. In fact just this past weekend I did indeed see it and I saw it up close and personal. The Chosun Taekwondo Academy is located in the Village of Warwick, which is quaint political subdivision of the Town of Warwick, one of the largest Towns in New York State. Master Doug Cook formed the school almost 20 years ago. Master Cook is a 6th Dan Black Belt certified by the Kukkiwon in Korea. He is a senior student of Dr. Richard Chun (Rhin-Moon), a Pioneer Grandmaster of Taekwondo in America. Master Cook leads his students and others on bi-annual tours to Korea, where they immerse themselves in the customs and culture that have helped make Tae Kwon Do Korean and gave it a sense of its own unique tradition, separating it from roots that came from other Martial Arts, primarily of a Japanese strain. He is also an accomplished author of 4 books, with more coming and a prolific writer who regularly contributes to TaeKwonDo Times and Totally Tae Kwon Do magazines. His work has been acknowledged by the Korean Embassy in Washington D.C. and various Hall of Fame entities. But of course some others can make those claims, so is this what makes Chosun Taekwondo Academy traditional? Well obviously the most important part of any Martial Arts school is the instructor. General Choi Hong-Hi, the principle founder of the Original Taekwon-Do would often say “soldiers are as strong as the general who leads them, and in a like manner, students can only excel under an excellent instructor. We cannot expect a bamboo to grow in a field of reeds, nor can we expect to find an outstanding pupil under an unqualified teacher.” General Choi would add, “It is of particular importance that the two aspects of Taekwon-Do, the spirit and the technique, must be taught together. Therefore a qualified instructor must combine the qualities of a scholar and a soldier if he is to produce pupils of noble character and outstanding skills.” It is so very apparent that Master Doug Cook has struck that balance. Maybe that is what makes his Academy unabashedly traditional. The spirit is within his students and was transported to the Town Hall, which served as a makeshift DoJang, as the larger facility was required to house the many students testing. In my invitation the number scheduled to be testing was over 115. While I did not take a head count and we had some more winter snow, it was clear that the projected target was reached, give or take a few no shows because of the inclement weather, as the Hall was full to capacity. The techniques were drilled at the school on Saturday and then performed on Sunday, witnessed by my own critical eyes. A signature trademark of traditional training that some old timers like myself might consider, is the constant repetition that far too often seems to get pushed aside lately, replaced by fun activities. These gimmicks are often inserted into Martial Arts training to bolster retention rates. However there is only so much change that can occur, before it is no longer Martial Arts! Perhaps the “gimmick” should be to educate your students as Master Cook does when he echoes the mantra Taekwondo is not a destination, it is a journey. The journey for students of Chosun Taekwondo entails so much both inside and outside of the Dojang. This is reflective of true takedown-Do in my view, as Taekwon-Do is life. It is a vehicle to enhance one’s life. From before the first step into the DoJang you are reminded of tradition by the requirement to remove your shoes. Once inside you will often hear soft “traditional” Korean music playing in the background. The decor of the training hall is adorn with “traditional” Chinese and Korean Calligraphy, including one of the few pieces of the famous Kukki Taekwondo dated March 20, 1971 written by General Park Chung-Hee, the leader of Korea who took over via a military coup in 1961. Those who enter the Academy may smell incense burning and the training begins with time for quiet reflection and mediation. At all times the students pay proper respect to age, rank and station in life, all aspects that comprise seniority. It doesn’t matter if the exchanges take place inside the DoJang or outside. As a result of my friendship with Master Cook, which dates back to 2009, I have had the occasion to spend time with his students at all kinds of events. I have always been treated with the highest level of respect and admiration by all of them. Traditions in a sense require to some degree at least, in making outsiders feel welcome, like visitors to your home. My interactions have naturally spread to forming closer relationships with some of his students. This is usually the case, as it has almost always been the case that Taekwon-Do exposes us to like-minded people, which in turn foster relationships. This was a goal of General Choi when he was formulating his original style of Taekwon-Do. It is usually infused in all, if not most Martial Arts. In just a couple of weeks Chosun Taekwondo Academy will host a Taekwondo Education weekend. On one of the days Master Cook will host a Taekwondo Talk, which will include the history and of course the traditions of the Art at their local library. This will coincide with a book donation drive, where the students and colleagues of Master Cook from his global network will donate Taekwondo books that they have written. While I will be traveling back to Korea for another Tul Tour I have pledged donating copies of the first book ever on Taekwon-Do, written in 1959 by General Choi and his 1966 ROK Army Taekwon-Do Manual. I am fairly certain that their library will be the only one in the world to have these rare books among their holdings, as General Choi’s books were banned by the military dictatorship at the time of his political exile. The final of what I call a trademark of traditional Taekwon-Do that I will go into here is the focus on self-defense. This was always want my training and teaching emphasized. In fact it was the very reason I began training in Taekwon-Do. It is also a central element of Master Cook’s teachings. To me self-defense is among the easiest things to share among various methods of training. In essence, if it works, it is good and worth spending time practicing. The various Taekwon-Do Patterns are comprised of a series of both defensive and offensive basics. During the testing I had the opportunity to observe live, right in front of me, several Patterns that I have little personal experience with, including one that has connections to some 650 years ago. At one point upon reflecting on what was going on in plain view, I became somewhat moved, as I was having old elements of “traditional” Tae Kwon Do shared with me, making the Taekwon-Do I love so much new again for me in some small way.